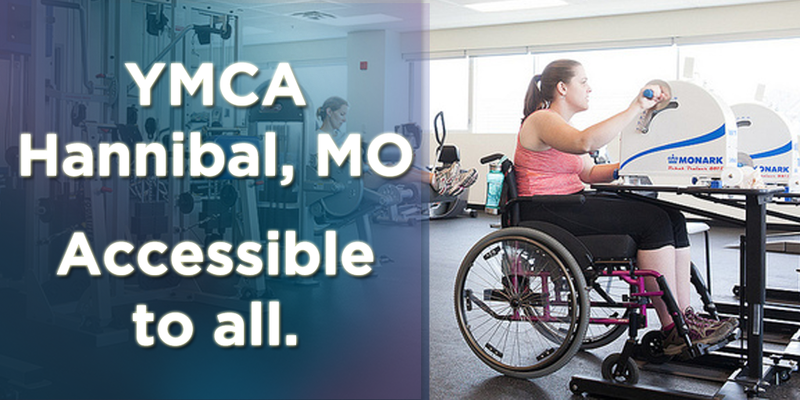 Located at 1 YMCA Drive Hannibal, Missouri 63401, the Hannibal YMCA is committed to the wellbeing of their community. They offer the community local programs focused in Youth Development, Healthy Living, and Social Responsibility. These programs are for any age group (youth, teen, and elderly) and consist of Aquatics, Sports, Wellness and Community Groups. So, whether you are looking for different physical activities, sports programs or just want to get out and enjoy all the great activities your community has to offer, this YMCA is for you! The Hannibal YMCA was established with one main goal in mind; to help strengthen the total person so everyone can reach their highest potential and enjoy an increased well-being. They work to achieve this goal through there three primary program categories. These include Youth Development, Healthy Living, and Social Responsibility. Their Youth Development programs include child care, swimming/sports/play, as well as camping trips. The Y understands that families have enough to worry about as it is and don’t need the added stress of finding quality child care. Their child care programs are set up with more in mind then simply looking after your children. They focus on the development of the kids by providing a safe place to learn foundational skills and to build new healthy friendships. As for their sports and recreational activities, they take the time to teach kids about the importance of becoming and remaining active throughout their lives. According to the Y, “Whether it’s gaining the confidence that comes from learning to swim or building the positive relationships that lead to good sportsmanship and teamwork, participating in sports at the Y is about building the whole child, from the inside out.” The Hannibal YMCA believes highly in nurturing the potential of every child and teen, to help them learn their true values and abilities! The provided Healthy Living programs go above and beyond what you would typically expect. Their wellness programs include different sports/recreation, physical fitness classes and facilities but also mind and spiritual strengthening programs. Additionally, they offer family time activities to help families grow greater connections and bonds. The wellness programs range from educational activities to promote healthier decision making, to programs supporting physical, intellectual and spiritual strength. The Hannibal YMCA knows that true well-being doesn’t only come from a clean diet or physical exercise. But instead, lies within strengthening the mind, body and spirit as a whole! According to the Y, “We know that when we work as one, we move people and communities forward. That’s why we are committed to providing support to our neighbors and opportunities for kids, adults and families to give, join in or advocate in the name of stronger communities.” In order to bring the community together as one, the Hannibal YMCA orchestrates community service projects, donations, volunteer efforts and social services. A community is like a family. You all live in the same area and understand the needs of the people around you. Together, a community can achieve almost anything but when divided, can achieve nothing. Coretta Scott King once said, “The greatness of a community is most accurately measured by the compassionate actions of its members.” When we look out for those around us and show love to those in our community, it becomes contagious. Little by little, everyone starts to benefit and the community as a whole grows closer and stronger. Invest in a more accessible world where everyone can succeed despite a disability. 100% of donations help people with disabilities. At Dreamscape Foundation, we offer an internal fundraising system that ensures that 100% of the funds you raise go directly to supporting accessibility. You can show your support for people with disabilities to everyone you meet when you purchase and wear one of our Dreamscape Foundation products.